This NetGear ReadyNAS review takes an in-depth look at the ReadyNAS 2100. Learn about the ReadyNAS 2100 features, setup and configurations to determine if it's right for your environment. This NetGear ReadyNAS review takes an in-depth look at the ReadyNAS 2100. Learn about the different features of the ReadyNAS 2100, and its setup and configurations to determine if it's right for your environment. NAS units are dedicated standalone units that attach to your network and contain both disk controllers and hard disks all in one unit that can be accessed by any device on the network. They can range from small one-drive units to multi-drive units that support multiple RAID levels to protect against disk failures. Most units support a wide variety of protocols that can be used to connect to the NAS unit, such as Windows CIFS/SMB, iSCSI, NFS, Apple's AFP, FTP and more. An optional on all the units is the ReadyNAS Replicate, which is a software license that enables the built-in replication feature on the devices. This allows ReadyNAS devices to replicate either all data or selected data to other ReadyNAS devices -- this allows having a remote off-site copy of the data. The ReadyNAS 2100 is sold in three different drive configurations with either four 500 GB, 1 TB or 2 TB hard drives for a total raw disk capacity of 2 TB, 4 TB or 8 TB. While most 3 Gbps SATA hard drives (currently there's no support for 6 Gbps) will work in the ReadyNAS 2100, NetGear only recommends certain manufacturer and model drives that are listed on their compatibility list. One big reason for this is reliability; all the drives on their list have the Rotational Vibration Safeguard (RVS) feature for maximum reliability and performance. While the unit can be mounted in a standard 19" rack, it is only 12.5" deep so it can easily be placed on a shelf or a desk; it also has a fairly small footprint. 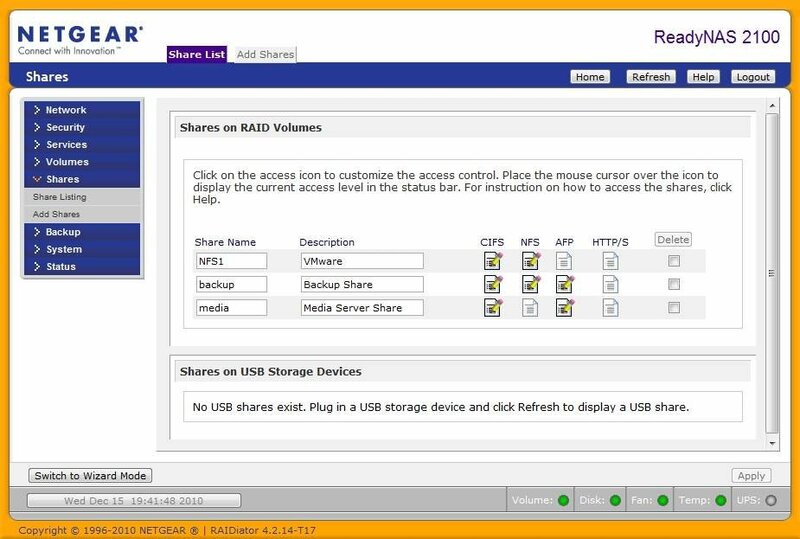 The 2100 supports RAID levels of 0, 1 and 5 using NetGear's Flex-RAID, which supports multiple volumes. Besides the traditional RAID levels, the 2100 also supports NetGear's proprietary RAID technology called X-RAID2 that uses a unified RAID level and supports only a single volume. The advantage X-RAID2 provides over traditional RAID is automatic volume expansion and support for mixed drive sizes in the RAID group. The front half of the ReadyNAS 2100 is the hard drive cage. The back half contains all the components such as the power supplies, disk controller, NICs, CPU and memory. The pieces connect via an easily removable backplane that NetGear calls the X-Change system. The front of the 2100 has a USB port, LED lights for drives, network, activity, USB and UID and buttons for system reset, power and backup. The backup button can be used to copy the data from the backup share to an attached USB device or can be programmed to run backup jobs as well. The rear of the ReadyNAS 2100 has two network ports and three USB ports. The ReadyNAS 2100 test unit reviewed is a 2 TB model that came with four 500 GB Western Digital 7200 RPM 16 MB cache 3 Gbps 3.5-inch SATA drives. The drives mount in hot-swappable drive sleds for easy removal. 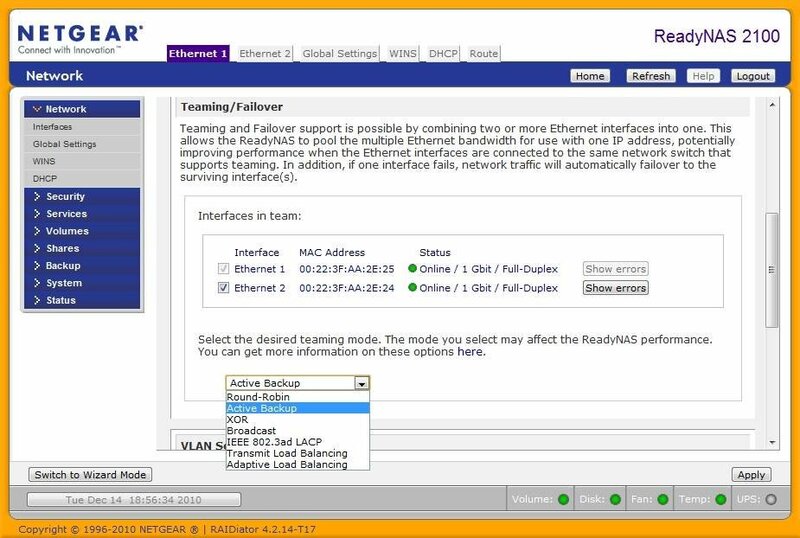 Once you connect the unit to the network and power it on, you need to discover it and configure it with Netgear's RAIDar utility that can install on any Windows, Linux or Mac. (This process is illustrated in Figure 1 below.) The 2100 defaults to obtaining an IP address using DHCP; if no DHCP is available, it configures itself with an IP address of 192.168.168.168. The RAIDar application will automatically discover the unit and display it; after you select it and click "Setup;" it will launch a Web browser interface with a setup wizard called RAIDiator. The setup wizard walks you through basic configurations such as setting time, SNMP/SMTP alerts, network, security, protocols and shares. There is an optional Advanced mode that gives you more configuration options. Below is a summary of some of the available configuration options. Network (see Figure 2 below) -- Allows you to configure network adapter information, WINS, DNS, DHCP and routing tables. The two network adapters on the ReadyNAS 2100 can be combined for teaming and failover in a variety of different modes including Active/Backup, Round Robin and Adaptive Load Balancing. You can also enable virtual LAN (VLAN) support and jumbo frames for better performance. Security -- Allows you to configure the device Admin password, recovery options and local or domain user accounts for access to shares as well as quotas for users. Services -- Allows you to configure the file system protocols used by clients to communicate with the ReadyNAS 2100. This includes CIFS, NFS (1 to 16 threads), AFP (Apple, supports Bonjour), FTP, HTTP, HTTPS and Rsync (Linux backup protocol). You can also configure discovery services for Bonjour and UPnP as well add-ons such as ReadyNAS Remote. Volumes -- Allows you to view RAID disk configuration, configure snapshot schedules, schedule volume maintenance and configure iSCSI volumes. You can also configure USB storage settings and set up an automatic copy of data from USB storage devices to a share on the 2100. Snapshot space is configured by default with a reserve of 10 GB of space. According to the documentation, this is configurable but has been temporarily disabled by NetGear and will be re-enabled in a future release. It is limited to only one copy-on-write snapshot at a time for CIFS and NFS shares (no iSCSI); however, there are community add-ons that support multiple snapshots. Volume maintenance includes disk scrubbing with automatic parity check and file system consistency checks. iSCSI supports iSnS and CHAP authentication and you can create multiple iSCSI targets of various sizes. Shares (see Figure 3 below) -- Allows you to create CIFS, AFP, NFS or HTTP shares on the 2100 or an attached USB device. You can also configure share access permissions as well as other advance share options. Backup -- Allows you to program the backup button on the front of the ReadyNAS 2100. Can also create backup jobs defining the source, destination, schedule and backup options (full/incremental). Source/destinations include drives in specific USB ports, FTP, NFS, Rsync, websites, shares, CIFS and Time Machine. Also has an option to use the online ReadyNAS Vault service as a backup destination. System -- Allows you to set the clock, NTP, alert settings, perfomance options, update firmware, power and shutdown options. Performance options include enabling the disk write cache, disabling full data journaling, optimizing for OS X and enabling fast USB writes by accessing USB devices in asynchronous mode. Power options include spinning down disks after a period of inactivity, a power timer that enables you to schedule powering the unit on and off at specific days/times, UPS monitoring and Wake-on-Lan. Status -- Allows you to see the health of various compnents of the unit including the disks, fans and temperature as well as view the system logs for the device. Once the unit is configured, you are ready to connect to it using any of the supported protocols. You can create shares for CIFS, NFS and AFP connections, which make use of all available disk space on the volume. You can also create iSCSI volumes where you define volumes. NetGear's business NAS models are VMware certified; you can use the ReadyNAS 2100 with vSphere using either the NFS or iSCSI protocols. Overall, the ReadyNAS 2100 is well-built and the management interface is easy to use. With its broad protocol and device support, the 2100 can be used as a multi-purpose workhorse and to serve the needs of a small business. For a business that wants to use server virtualization, a device like the ReadyNAS 2100 can provide the shared storage for your hosts. The retail price of the 2 TB (4 x 500 GB) model is $1,599, the unit is also available in 4 TB (4 x 1 TB) and 8 TB (4 x 2 TB) configurations. If you need more performance and redundancy the ReadyNAS 3100 has the same form factor as the 2100, but comes with a multi-core CPU, more memory and redunandant power supplies. However, if you are looking for an affordable network storage device that is loaded with features, the ReadyNAS 2100 is definitely worth considering. About this author: Eric Siebert is an IT industry veteran with more than 25 years of experience covering many different areas but focusing on server administration and virtualization. He is a very active member in the Vmware Vmtn support forums and has obtained the elite Guru status by helping others with their own problems and challenges. He is also a Vmtn user moderator and maintains his own VMware VI3 information website, vSphere-land. In addition, he is a regular blogger and feature article contributor on TechTarget's SearchServerVirtualization and SearchVMware websites.